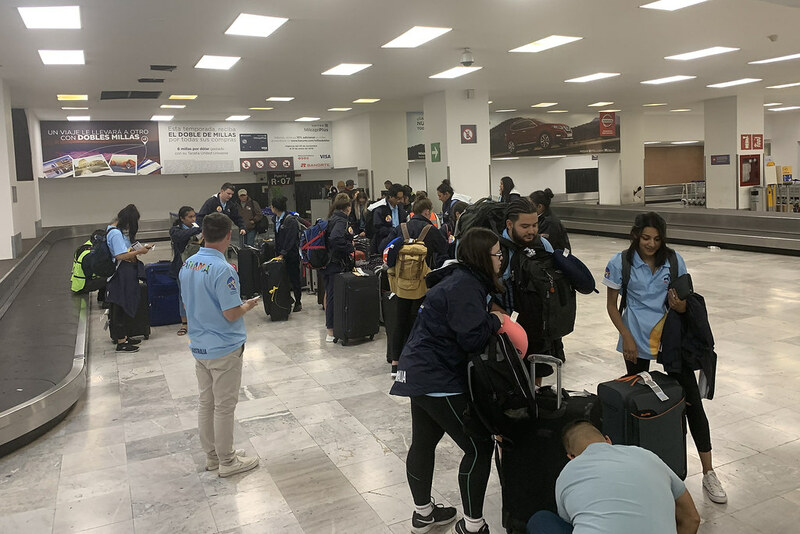 Pilgrims en route to World Youth Day 2019 from the Diocese of Parramatta have been challenged to “create a massive space for God” as they embark on their first complete day as a group in Mexico. The challenge came from Fr John Paul Escarlan (Mary, Queen of the Family Parish, Blacktown) during the opening Mass, celebrated by Bishop Vincent Long OFM Conv at the historic Santa Maria Tonantzintla Church. Constructed in the late 17th century, Santa Maria Tonantzintla, outside the town of Cholula is a visually striking church where its interior blends the shape of a European baroque-style church with a mosaic of mouldings depicting aspects of the indigenous culture, such as figures, masks, and flowers. The centrepiece, a statue of Our Lady of Guadalupe, provided a stunning backdrop for the Mass which honoured Mary, the Mother of God. Fr John Paul Escarlan said Mary was the perfect model of Christian Discipleship and that pilgrims should try to have a humble and faithful heart like Mary’s and this humility should lead to a life of service. Father John Paul Escarlan (centre left) and Bishop Vincent Long OFM Conv (centre right) say Mass inside the Church of Santa Maria Tonantzintla in Cholula, Mexico. Image: Diocese of Parramatta. He said in order to create this, pilgrims will need to, “like Mary…create a massive space for God, be open to God. We are far from home and Mary during her life was far from home when she travelled to Bethlehem and escaped to Egypt.” He warned pilgrims that there will be challenges and problems on the pilgrimage, but ultimately the experience is a journey of faith. After the Mass, pilgrims were welcomed by local Catholic youth from the Archdiocese of Puebla who served as guides and translators for the pilgrims. It was also an opportunity for the local youth to share with the pilgrims their own experience of life and faith in Mexico. In the afternoon, pilgrims travelled to Cholula for lunch and walked up to the monumental Our Lady of Remedies Church that was built on top of the Great Pyramid of Cholula, the Tlachihualtepetl, ‘hand made mountain’, the largest pyramid in the Americas. The 171 Diocese of Parramatta pilgrims pose for a photo at Our Lady of Remedies Church, on top of the Great Pyramid of Cholula, Mexico. Image: Diocese of Parramatta. Pilgrims then travelled into Puebla where they will stay for the next two days.